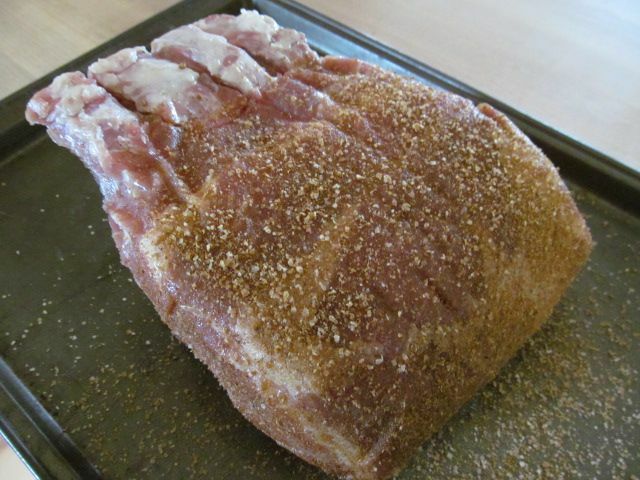 When you get down to it, a rack of pork is one big pork chop before the butcher slices them up into individual chops. I love roasting this cut of meat on the smoker at high heat so that the outside gets crispy and brown and the inside says nice and juicy. First, I take my rack of pork, rinse with water and pat dry. Then, after a thorough massaging with olive oil, I liberally apply rub to all surfaces of the meat with whatever flavor I am in the mood for that day. In this case, I used Dizzy Pig Raging River Rub. This rub is a nice combination of citrus and maple flavors. It really does pair well with pork. But, you could use whatever you have on hand or whatever you are in the mood for that day. 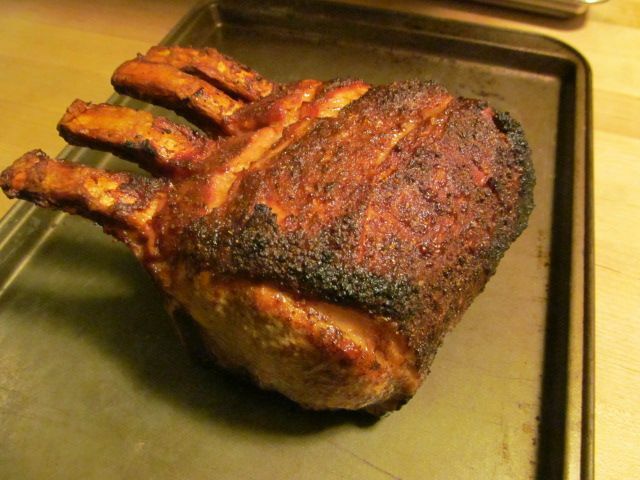 I fired up my smoker to 375 F, then placed the pork on the top rack with some apple wood in the ash pan. I cooked to an internal temperature of 140 F, then pulled from the smoker and let rest with foil tented over the meat for 15 minute. At this point, to slice, I remove the bones, then slice the roast part of the rack. The high heat smoking locks in the juices and makes for a nice, juicy and fork tender piece of pork. One of my favorite methods for preparing this cut of meat. Your cooking method is exactly the same as I would do. 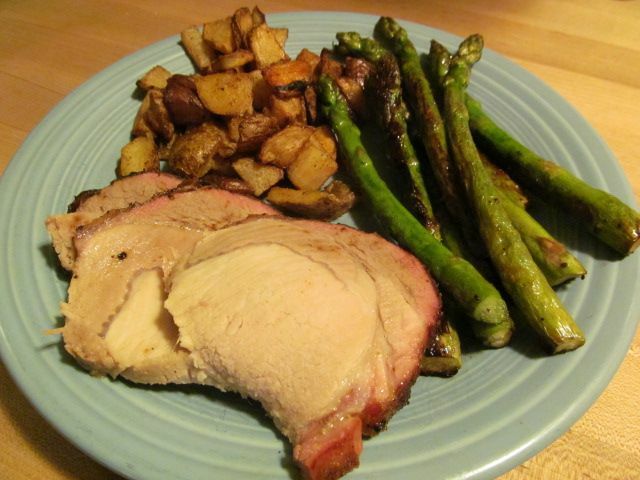 It is a treat when we get a pork roast from Bledsoe Farms who sells at the U.C. Davis Farmers market. I would like to find a rack of pork from a Berkshire pig. I think it would be great. That looks great, Bill! Have done a few racks of pork before but am well overdue for one! 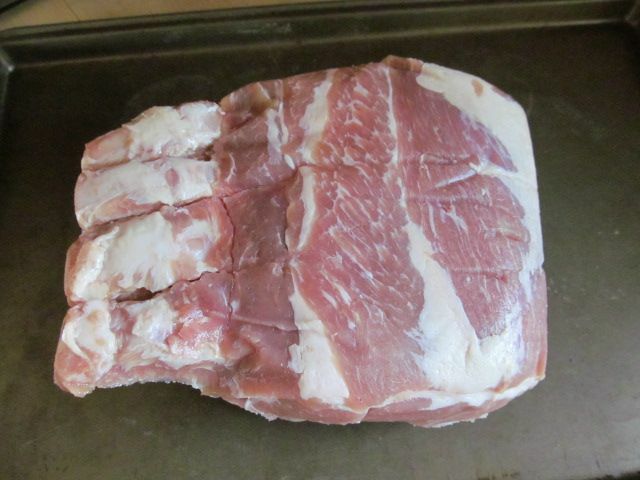 This is my favorite cut of pork Gus. Good stuff!